And so off into another year. But not just another year for it is 20 years since Klaus Heymann and I first started Naxos AudioBooks. And what a couple of decades it has been. It seems so long ago that we listened on cassettes, pushing those cartridges (and the very occasional CD) into the car radio, and settling for, in the main, abridged texts. Ah yes, I remember those days in 1994 when I first approached Heather Godwin to ask her to abridge Jane Austen and saw her face whiten palpably; and asked Roger Marsh to abridge Ulysses, only to receive some upfront Saxon words that Joyce would have approved of. But, I explained (pleaded?) this was the norm for audiobooks. And they capitulated, producing exemplary recordings which set the tone for our mission: Classic Literature with Classical Music. Then along came the download medium (Naxos AudioBooks was the first dedicated audiobook publisher in the UK – maybe even in the world – to have its own download site), phones, smartphones, audible and much else. And here we are listening to unabridged audiobooks running to many hours, some even more than a hundred hours! Who would have guessed it, in 1994. 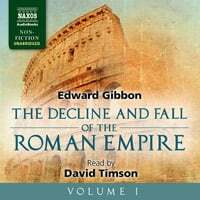 So, HOW appropriate that we pepper our 20th year with the unmatched, unforgettable, unbelievable recordings by David Timson of the six volumes of Gibbon’s The History of the Decline and Fall of the Roman Empire. As publishers of the unabridged Proust on audio, it can be said we do not shirk before challenging projects. Nevertheless, Gibbon is really an Everest. It was 250 years ago this year that Edward Gibbon, a relatively unknown English writer, sat upon the Capitoline Hill and decided to review the history of Rome, a first thought that expanded into the immense project that dominated his life and set the bar for historians of all periods to come. Each of these big books sets its own particular tests for the reader, but the Gibbon more than most. For a start there is the size. We are still just finishing editing the final volume, and it will stretch to around 110 CDs – more than 140 hours. Then there is the famous magisterial prose. Lofty, Augustan and dense – not just with historical content but with informed opinion as well. And there are the thousands of names – of places, people, events and concepts. David Timson has prepared these with considerable care, investigating the pronunciation of Greek, Roman, Arabic, Chinese, Mongolian, Hunnish names, and more Germanic tribes from the ancient world than most people had ever heard of, not to mention arcane English words and a host of other European languages. All in all, David spent months preparing each volume. ‘Reading it was the easiest part,’ he says, but that is only because he is an outstanding reader. There are many editions of Gibbon (even during his lifetime it appeared in numerous guises). David chose the Oliver Smeaton Everyman edition, and read from a handsome leatherbound set he discovered in a bookshop in Hay-on-Wye where he generally spends his summer holidays. 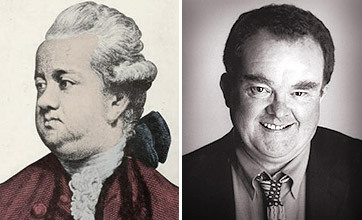 If you look at the pages of the volumes you can see how carefully David prepared – every line is marked carefully; this is the way he has prepared all his readings during a lifetime in radio and the spoken word, whether it was one of his thousand BBC broadcasts or the scores of audiobooks he has recorded. The main words in each paragraph are marked with tiny pencil underscores to indicate the stress of the syllable or the word in the sentence. But what is special about these pages are the little pencil circles. These indicate the inclusion of the footnotes. Gibbon added thousands of footnotes to his main text at various stages of the writing process. Some of them just give page references to a classical text or a source book and can be ignored for an audiobook recording. To read this, page after page, with a well-modulated and interested fluency, is what Gibbon needs and deserves. He would, I am sure, be grateful to David and entertain him royally in his club. The Naxos AudioBooks recording of Decline and Fall has been superbly edited by Sarah Butcher, our chief editor; and a script is being meticulously prepared by Jude Stedham so that it will match exactly what David reads, with all the footnotes in situ. With myself fulfilling the role of producer, we adorned ourselves with the title Team Gibbon, and met from time to time to mark progress, clarify issues, sustain morale and imbibe liberally as an interim reward. With David being a busy teacher at the Royal Academy of Dramatic Art, and also reading other texts, we have been working on this for 18 months, and the project will have taken over 2 years by the time Volume 6 is issued in October this year (though it will be available on download before then). It will be, I hope, a fitting tribute to mark the 250th anniversary of Gibbon’s initial inspiration, and the 20th year of Naxos AudioBooks; and will, along with the unabridged Proust, unabridged Dickens, unabridged War and Peace and unabridged Ulysses, be one of the pillars that has supported Naxos over these decades. And if you think I am getting a bit lofty – you will find after listening to hours of David’s Gibbon, asking for a cup of tea is no longer a simple business. It will require at least one, if not more, footnotes.